Have you received a large amount of money from a settlement, lottery winnings or inheritance? Take this quiz to help you decide if a lump sum or annuity is right for you. 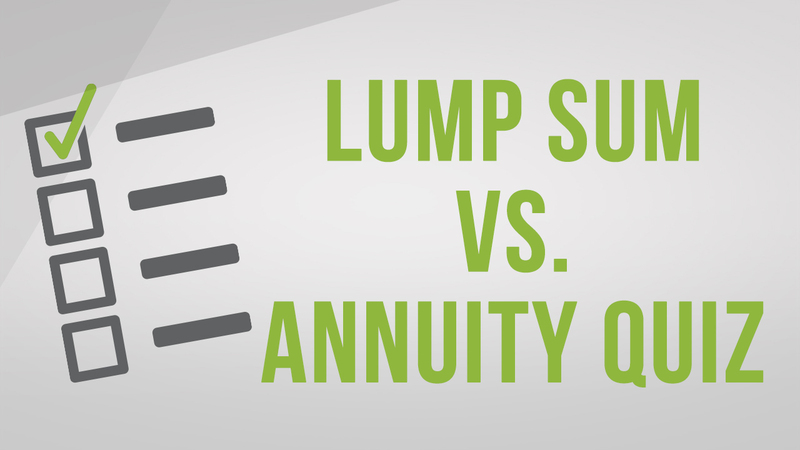 Should you take a lump sum or annuity? Take our quiz to find out. Instructions: Select the letter that most accurately answers each question. Please note this the Lump Sum or Annuity quiz should just be a guide – a starting point that helps you think through this important financial decision. Approximately how much credit card debt do you currently have? Will you hire a team of advisors? Will you follow the advice of your advisors? Do you have any negative feelings about the money you are receiving? Do you have a diagnosed psychiatric disorder? Do you think your friends/family will pressure you? Do you have a hard time managing your finances? Prior to your sudden wealth, did you have other investment assets that total more than $50,000? Do you plan on investing your money with a financial advisor in stocks and bonds? Do you want to invest your money in non-traditional investments? Do you expect an investment return of more than 10% per year? Do you have an interest in investing in a bar, restaurant, or club? Will you manage your investments yourself? Would your friends or family say you have a gambling problem? Do you have supportive friends/family? Will you agree to limit your decisions in the first several months of receiving your sudden wealth? Would you consider your sudden wealth to be a curse or a blessing? Will you follow the 12 principles of sudden wealth as documented in the book, The Sudden Wealth Solution? Do you think you’ll have trouble taking control? Does any part of you worry that you will run out of money? Will the sudden wealth boost you by more than one socioeconomic class (e.g., lower class, middle class, upper class, affluent, highly affluent)? Was the sudden wealth anticipated? Almost done! Now please enter your name and email so we can send you your results. Don't worry, this is for quiz results only - not for spam.